“With oil boom, however, agriculture was almost jettisoned despite the fact that it is the largest employer of labour and highest contributor to the nations GDP. Nigeria is said to be a major exporter and producer of oil yet it contributes only 2.7 per cent of the total oil produced globally while one of the major destinations of its product, the United States, contributes 8.6 per cent of the total world oil. What this transcends is that the nation is relying on an area that really may not be its strong point and most likely to fail in the nearest future due to the depletion of the nation’s oil reserve“. RECENTLY, I was privy to the discussion between two women at a cassava grinding mill. The subject of their discussion centred on the dwindling price of garri, a major by-product of cassava, a staple food that feeds millions of Nigerians and only comparable to rice in terms of its consumption. The women had argued that the price of garri in the market was not commensurate with the efforts that they put in and while the prices of other essential commodities continued to rise, that of garri had continued to plummet to their consternation. They based their argument on the fact that the processes involved in the production of garri are cumbersome and that the gestation period of almost a year (depending on the variety) does not make for quick sale and by extension, quick money, yet, they have to sell to the local market which has been flooded with too much of the commodity thus bringing down its price and affecting their income negatively, and by extension, their standard of living. The above scenario holds true for some of the commodities produced or manufactured locally which, due to years of mismanagement, inconsistent and poorly conceived government legislation as well as lack of adequate attention and monitoring, have continued to be produced in small quantities and left only for local consumption while the farmers or producers of such commodities are discouraged from producing in bulk due to lack of incentives to produce more. 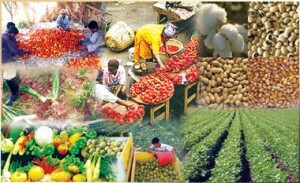 Agriculture, which even though contributes about 40 per cent of Nigeria’s Gross Domestic Product (GDP) and accounts for at least two-thirds (70 per cent) of employment, has been neglected over the years especially since the exportation of oil in the 1970’s and this has resulted to a near neglect of a once vibrant and economy sustaining sector. Before the discovery of oil, Nigeria prided herself as a giant in exportation as far as some agricultural commodities was concerned. Then, Nigeria played key roles in the supply of cocoa, groundnut, cotton, oil palm, rubber etc to the international market as she was a major exporter of these products. With oil boom, however, agriculture was almost jettisoned despite the fact that it is the largest employer of labour and highest contributor to the nations GDP. Nigeria is said to be a major exporter and producer of oil yet it contributes only 2.7 per cent of the total oil produced globally while one of the major destinations of its product, the United States, contributes 8.6 per cent of the total world oil. What this transcends is that the nation is relying on an area that really may not be its strong point and most likely to fail in the nearest future due to the depletion of the nation’s oil reserve. It is a fact that only very few economic growths of developed countries were sustained without agriculture as the foundation or seismic twin. Agriculture remains the shortest cut to an improved standard of living as it lays the foundation for smooth transition from one generation to another with marked improvement in the farming techniques with each successive generation. The largely subsistence form of farming that has been occasioned by years of neglect and too much attention to the oil sector has resulted in the nation not been able to feed its teeming population. Nigeria has had to import foods which she can produce to feed her geometrically increasing population. A recent World Bank report has stated that African farmers can potentially grow enough food to feed the continent and avert future food crisis. According to the report, the continent would also generate an extra US $20 billion in yearly earnings if African leaders can dismantle trade barriers that blunt more regional dynamism. It can be deduced from the above that Nigeria, with 82 million hectares of land that was found to be arable by a report in 1992 can feed not just itself alone but also a larger part of other African countries. It is a painful fact, however, that only about 42 per cent representing 34.4 million hectares is put to use in a form that does not encourage mass production. The form of land ownership and land tenure system has not encouraged mass production of goods that could be a major source of revenue to the country. Thus people continue to farm with the immediate objective of feeding only their families and selling to the local market. This owes mainly to small land holdings and subsistence farming. In effect, the quantity of food available and produced in the country is not sufficient to feed the growing population of Nigeria which has an annual growth rate of 3.2 per cent. This has made a country with so vast a large area of arable farm land to be dependent on foods produced by other countries. It can also be said that one of the major challenges facing the mass production of food products and even its exportation to other countries is the largely subsistence nature of farming. Various agricultural laws from the 1970’s including the Land Use Act of 1978 that attempted to remove the barrier in land ownership has failed as successive governments came up with their own blueprint that was soon jettisoned with the coming-in of yet a new government. The nature and pattern of governmental laws on the importation of products especially agricultural products has left much to be desired. The lifting and placement of embargoes on the importation of certain products at will has called to question, the interest of those who advise the Presidency on the placing and lifting of such embargoes. Personal interest has, in most cases, overshadowed national interest as bribery and corruption would not allow for the right legislations. Furthermore, due to oil boom, successive governments have paid and continue to pay lackadaisical attitude towards the growth of the agricultural sector. On paper, they seem to be trying but the implementation of various white papers on the agricultural sector has been nothing to write home about. The country is currently trying to grasp with the growing rate of unemployment that is said to be 23.9 per cent and the one area which can accommodate a majority of these figures has not been exploited to the fullest. This is not to say, however, that the Nigeria of our dream where agriculture is accorded its rightful place and where youth restiveness and all forms of social vices are at the barest minimum, cannot be realised. The agricultural sector represents the shortest cut to achieving and sustaining a buoyant economy. Nigeria is said to be the 26th largest economy in the world and the best economy in Africa based on its rebased GDP of US $522 billion. This can only be sustained and more growth recorded speedily if adequate attention is paid to the agricultural sector. With more attention to the agricultural sector, Nigeria’s objective of being among the top 20 economies of the world by the year 2020 can be achieved before the target year, but only if the pattern of approach to the agricultural sector is changed forthwith. First, the government must put in measures to make agriculture as lucrative and economy boosting as it used to before the discovery of oil. These days, children of this generation have negative perspective as far as agriculture is concerned. They believe that farming is only for the poor and hence practised by those in the rural areas. This perspective can only be changed by a good legislation that will favour local farmers to do more by providing adequate markets that will encourage them to do more. This can be done by ensuring that avenues for the sale of their products (both local and international) are made available. Second, the nature and form of land ownership in Nigeria must be changed as a matter of urgency. The Land Use Act of 1978 has not had much impact as small holdings still hinder the mass production of goods. Incentives must be given to farmers and large areas of farmlands made available at affordable prices to those who are willing as well as able to cultivate such lands. Incentives could also be in the form of giving farmers crops and seedlings with improved varieties. Third, the role of extension workers which has reduced over the years must be revamped. For instance, as with the case of the women mentioned above, there abound many farmers who have a fairly large area of farmlands and the sale of their product is limited only to the local market which makes most of them to run at a loss because similar goods flood the market. In such a situation, these rural farmers must be educated on the need to exploit other avenues of selling their goods and if possible, the excesses of their commodities could be bought from them and sold to other areas of the country where the supply of such commodities is inadequate. Perhaps the most important area in which Nigeria can feed its teeming populace without sweat and bring us closer to the attainment of the Nigeria of our dream is by providing the necessary capital that would make agriculture as lucrative as the oil sector. This can be done in many ways. There is the way of making land available in large quantities to willing farmers and providing them with seedlings to be planted on such lands based on the soil structure, texture and profile of such lands. Then, there is the way of follow-up to those giving these lands to ensure that they are doing the right thing. There is also this important way of giving them improved farming equipment as well as all the necessary tools to tackle the problem of pest and diseases. Finally, there should be a way of ensuring that their products get to the international market after a large quantity has been made available to the local market. Surely, if these avenues are exploited and followed religiously, then the challenge of feeding the Nigeria of our dream will no longer be a mirage but a fruitful reality. • Okorodudu, a youth advocate and social commentator, wrote from Delta State.